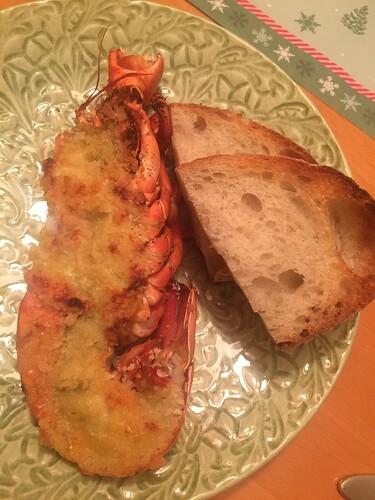 So, I eventually had my first experience with lobster - both cooking and eating it. We were thinking about serving it for a starter for New Year's Eve, but we didn't want to make it then for the very first time, so we got a practise lobster first. Smart move! As it turns out, we're not huge lobster fans. If you are, then this recipe is great - the flavor combination is right on - but if you're not, well, make something else. I'm not big on shellfish in general actually, I find the entire idea a little off-putting... but sure, it's tasty enough. Anyway. On to the recipe.